Three years ago Mo Farah was beaten by Kenenisa Bekele in the Great North Run after the Ethiopian surprised him with a sudden, downhill burst approaching the sea front with just over a mile to go. Since then the Briton has been undefeated on the Great North Run course and on Sunday he won his third title after using similar tactics to beat long-time leader Dathan Ritzenhein. The American, who used to train with Farah and is working towards the New York City Marathon in November, went into the short, steep hill that descends on to the South Shields promenade neck and neck with the defending champion, but the Briton surged ‘Bekele style’ on the tricky descent to establish a winning lead. For the Briton, it ended a great season where he has retained his Olympic titles at 5000m and 10,000m, whereas Ritzenhein enjoyed a good build-up race to New York. In third, Emmanuel Bett of Kenya clocked 61:22 as Bashir Abdi of Belgium was fourth in 62:03, Duncan Maiyo of Kenya was fifth in 62:03 and Abdi Abdirahman of the United States was sixth in 62:46. Close behind, Chris Thompson was the top Briton behind Farah in seventh with 63:35 followed by Ben Connor, who ran 64:13, and Scott Overall, who clocked 64:39, while Great North Run local stalwart Ian Hudspith ran 66:52 in 15th aged 45. Brilliant blue skies and bright conditions greeted the runners and, after Great North CityGames 500m winner David Rudisha set the elite men and masses on their way, Ritzenhein led the field through 5km in 14:16. By 10km, Bett took over and went through the 6.2-mile mark in 28:32 as Farah followed him and Ritzenhein appeared to be struggling as the American dropped back slightly. A few minutes later, though, Ritzenhein resurrected his form as he surged back into pole position. Even more impressively, Ritzenhein’s efforts as he continued to lead through 15km in 42:36 caused Bett’s challenge to falter as the Kenyan fell back. This meant the final few kilometres turned into two-man race as Ritzenhein led Farah toward the finish at South Shields. 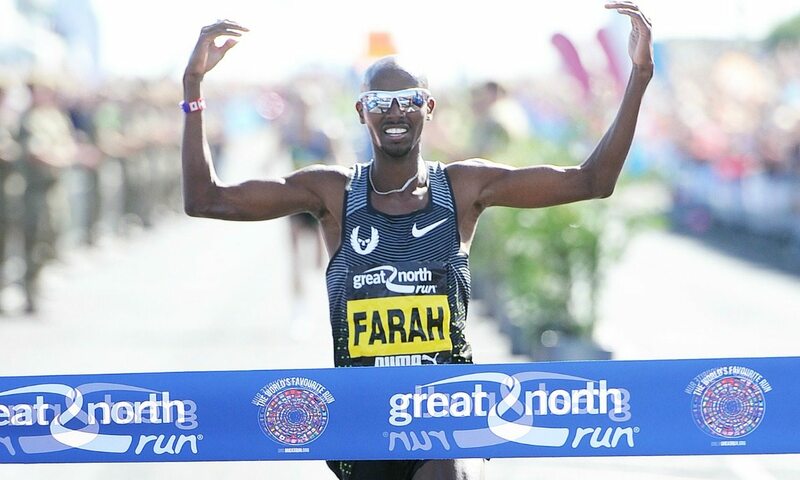 Then, as the duo came down the steep hill on to the sea front with just over a mile to go, Farah surged clear and established his winning gap. This meant the multiple Olympic and world champion built an insurmountable buffer over his rival on the long, flat run-in to the finish and he was able to enjoy the final stages. With first place assured, in the final metres Farah raised his right arm in a victory salute to local football legend Alan Shearer, a gesture the athlete had hinted a few days earlier that he might do if he managed to win. “Even though I’m an Arsenal fan, I wanted to do a ‘Shearer celebration’ as he’s such a great, legendary player from this area,” said Farah. For Farah, it is rare to win a race that does not require a sprint finish. This was not the case in the men’s wheelchair race, though, as Mark Telford was forced to work hard all the way as he beat Bret Crossley narrowly with 49:01.